New observations suggest that Saturn's biggest moon might have a hidden secret. 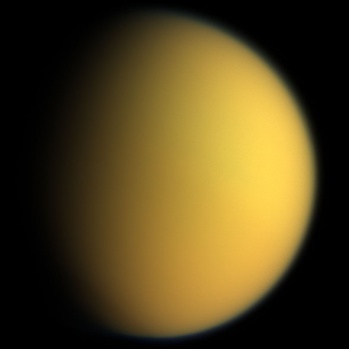 Titan, the largest of Saturn's 62 moons, is known as being the only object in our solar system other than Earth to possess a hydrological system that revolves around a cycle of rain and evaporation. This means that while seas and other large bodies of liquid are expected to form around the moon's poles, its arid equatorial belt should remain nice and dry as liquid evaporates from its surface and heads back to the poles. However, as scientists investigated information captured by the Cassini spacecraft between 2004 and 2008, they discovered that this supposedly "dry" desert area is positively festooned with what look like puddles, ponds, marshy areas, and even a suspected lake. In this week's Nature, one group has put forward a promising theory to explain how these potential bodies of liquid have managed to sustain themselves, and it contains all kinds of interesting implications. Led by Caitlin Griffith, a planetary scientist at the University of Arizona in Tucson, the researchers posit that Titan's mysterious desert ponds are being fed by "subsurface oases" of liquid methane. This makes sense for a variety of reasons, not least of which is the well-documented and large supply of liquid methane floating around Titan's poles. Having such large stocks of the liquid hydrocarbon floating around beneath the planet's surface throws up all kinds of interesting ideas, not least of which is what its prescence might mean for the development of complex molecules, and perhaps even life forms, on the moon. Methane, while generally unfriendly and often fairly flammable, is composed of one carbon and four hydrogen atoms, essential elements in the building blocks of life. Astrobiologist Jonathan Lunine of Cornell University, while not involved in this particular piece of research, is excited about the prospect. "There may be organic chemical processes that occur in liquid hydrocarbons that could lead to compounds analogous to proteins and information-carrying molecules," he said, commenting on the work. "There might be a kind of life that works in liquid hydrocarbons." "There's a place on Titan named Xanadu, and if you go back to the Coleridge poem on Xanadu, he talks about 'caverns measureless to man'," continued Lunine, adding that he'd "love" to find such caverns filled with hydrocarbons under the surface of Titan. Lunine and Griffiths are both part of the team proposing that NASA send a mission to Titan to look for signs of such complex molecules in the moon's northern seas. Named the Titan Mare Explorer (TiME), the craft's gathering mission would last for three months. NASA will apparently announce whether or not it will run the mission "soon." In the meantime, we'll just have to wait to see if Lunine's musings on the potential for new forms of life born of hydrocarbons hold any water (or liquid methane). It'll also be interesting to see what implications the results of the research could hold for potential human involvement in Titan. While it looks generally inhospitable, it is bigger than Mercury and would take significantly longer to kill us than that planet would (for example, we'd suffocate from the lack of oxygen rather than boil to death. Tasty). Plus, I heard from this guy from three million years in the future that he spent some time on Titan and Ganymede when he was younger, so who knows? Good luck to the TiME mission and its search for hydrocarbon-based potential life, in any case.